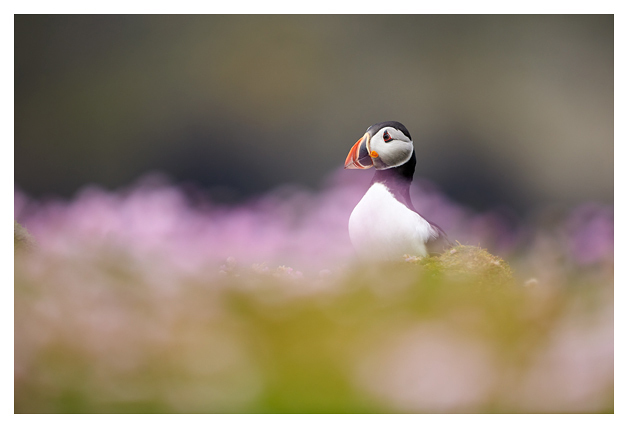 This summer, I was guiding a tour for Natures Images to Fair Isle, a small, remote island just south of Shetland. 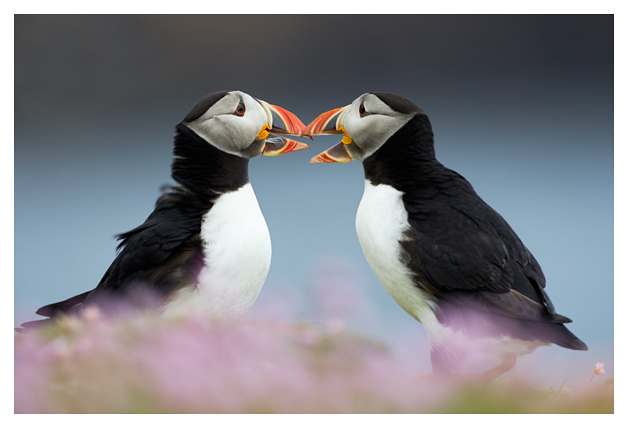 Fair Isle is an incredibly special place, inhabited by thousands of seabirds and migrating bird species, but only by c.50 people. It is beautiful and wild, battered by winds and waves. and a place that I always look forward to returning to. I’ve stayed on Fair Isle a number of times now and this was my third guiding tour on the island, leading the Puffin Bonanza trip. 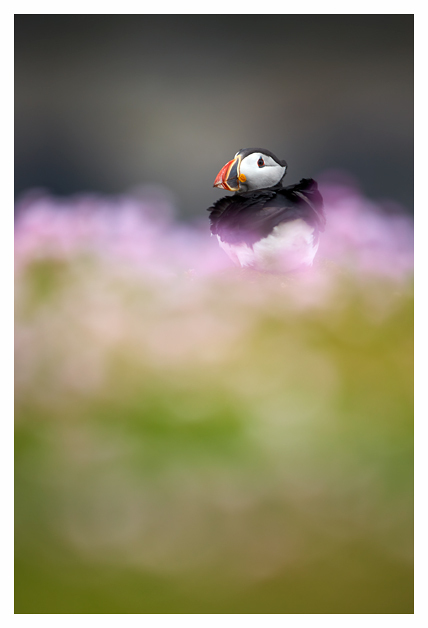 If you like to photograph seabirds, Fair Isle is without doubt one of the best locations in the UK, especially for one of our most charismatic summer visitors ~ the Atlantic Puffin. I met my group of photographers at Sumburgh on mainland Shetland the day before our journey to Fair Isle. As I’ve already mentioned, Fair Isle can be battered by wind & high seas, or if conditions are calm, sometimes sea fog, so I’m always a bit like a cat on a hot tin roof until I know that our short flight to Fair Isle is running on schedule. For our trip this summer, our travelling worked like clockwork, and we arrived on Fair Isle the following morning to the news that a pod of Orcas had been spotted. We raced out of the Observatory and there they were, Orcas patrolling the rocky coastline on the hunt for seals. What a welcome! Thirty minutes later, we were hurtling down to the South Lighthouse with Susannah from FIBO at the wheel, again to observe these awesome predators; I must admit, I only took a couple of images, I just watched and enjoyed with my group and most of the island’s inhabitants. After this initial excitement, we got into a more relaxed groove for our forthcoming week on Fair Isle. 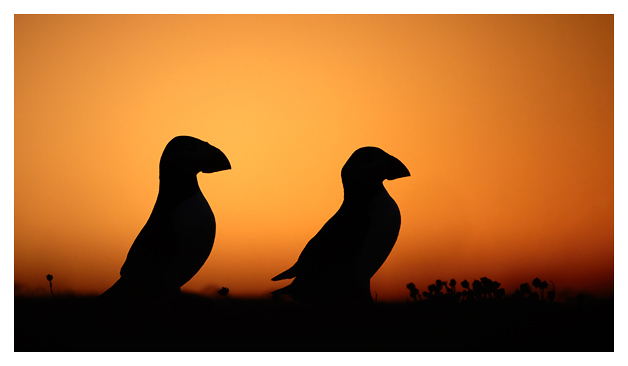 This trip is timed for chick-rearing, and is therefore the best time to photograph Puffins with sand eels in their beaks. And of course the Sea Thrift is also at its peak, the lovely pink flower that adds a different aspect to the images. 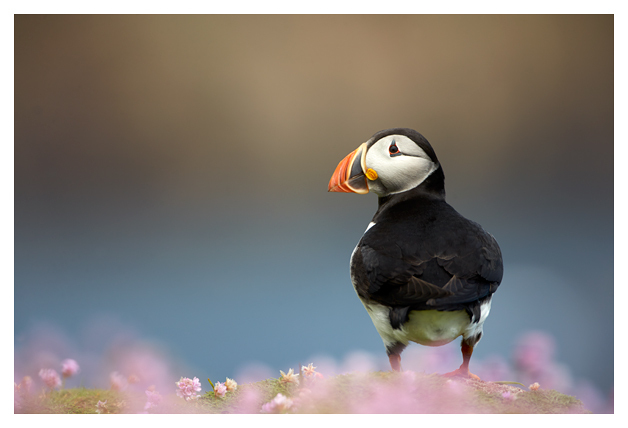 The RSPB has been running a UK monitoring study this summer in order to ascertain what fish species the Puffin is catching. 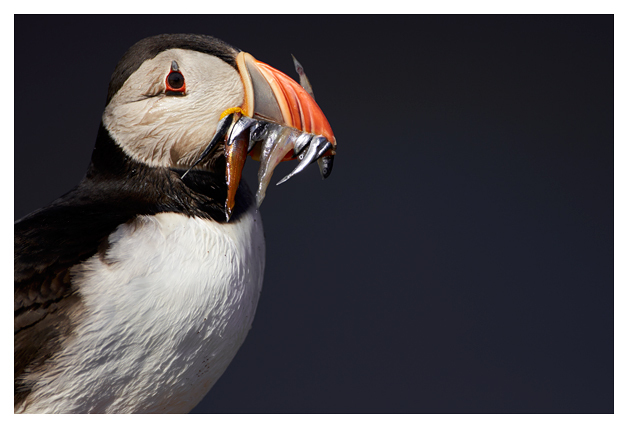 Ideally, sand eels are the best diet for a Puffin chick (Puffling), because they are smaller and easier to swallow, rich in fat and therefore more nutritious. 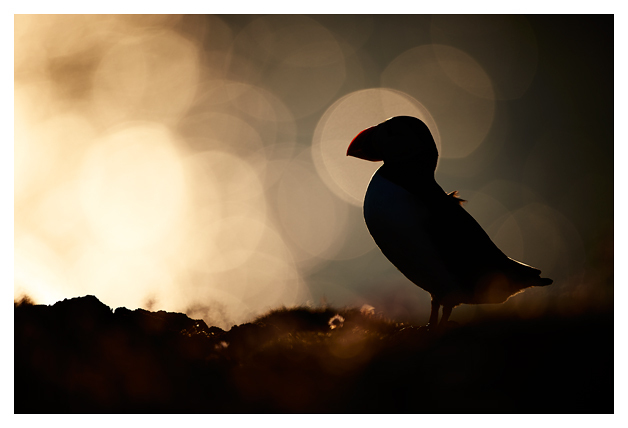 However scientists believe that sand eel concentrations are being affected by changes in ocean currents ~ our warming climate is affecting the circulation of warm & cold ocean currents around the UK and Iceland, and Puffins must either travel much further to catch sand eels (which can be detrimental in the longer term to their overall health) or alternatively catch larger fish which are not as nutritious for the Puffling. 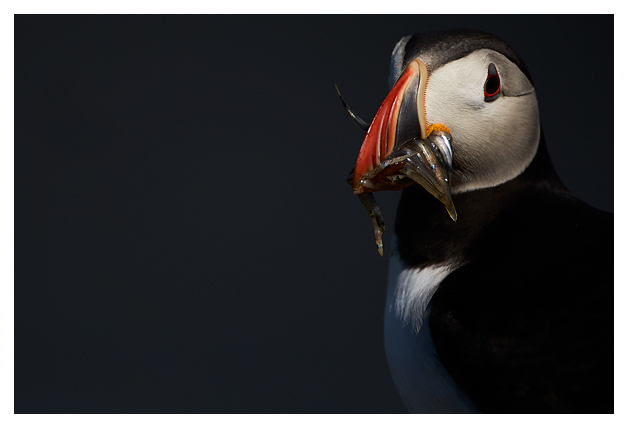 Common sense tells us that this is having an effect on Puffin breeding numbers particularly around the Scottish coast. It isn’t all doom & gloom however. The number of non-breeders on the island is fairly healthy following two years of successful breeding, and it is hoped they will fare well over the forthcoming months and years. 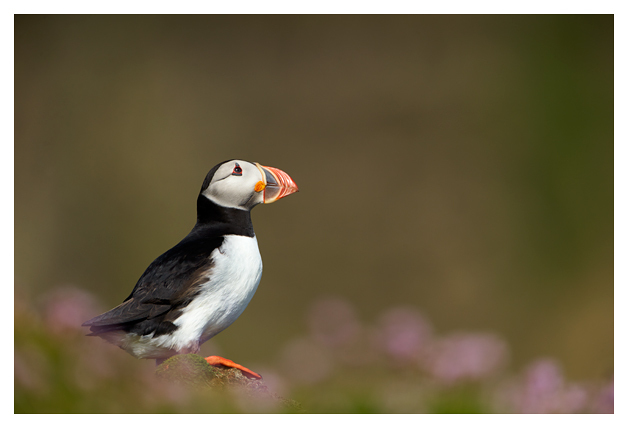 I’ve photographed Puffins on Fair Isle a number of times now, and I never get over the spell that this place casts over me. I also think the spell was cast over my group too. During the summer months, you can experience the ‘simmer dim’, a magical time after sunset when the sky lights up with golden colours and the darkness never really takes hold. The sky truly simmers. 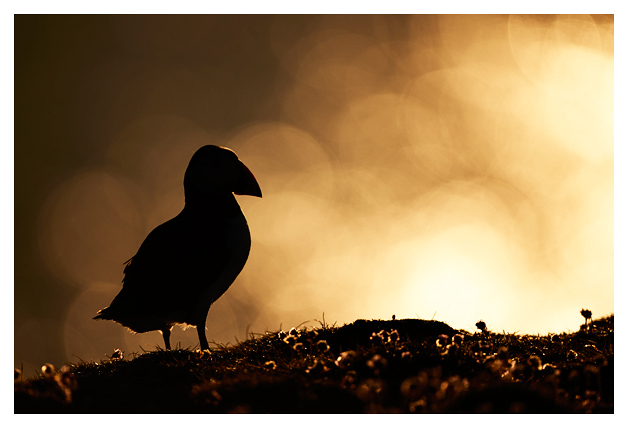 It’s a great time to photograph Puffins against the sky and the sea, or even just sit on the cliffs at midnight and watch the Puffins socialising around you. That’s why Fair Isle is so special. I haven’t mentioned ringing Storm Petrels, doing the fascinating archaeological & natural history walk, or even the delights of the FIBO bar; something for another time perhaps! 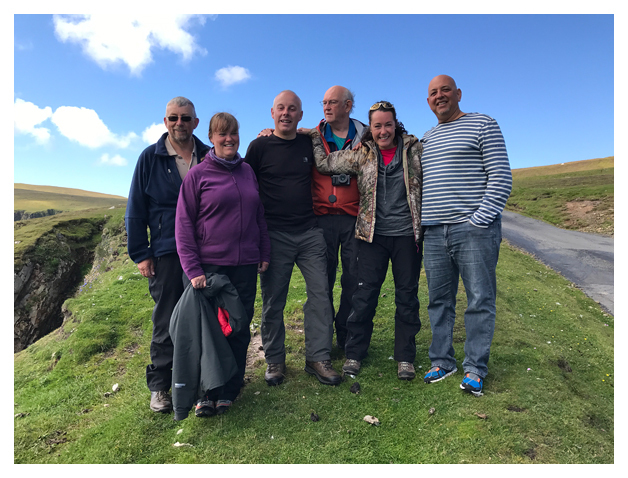 I’d like to thank my Natures Images group Aviv, Patrick, Colin, Yvette & Greg for the fun, laughs and enjoyment that we had, and also big thanks to Susannah, David, Chris & Ciaran and everyone at the Fair Isle Bird Observatory for looking after us so well. Lovely stuff Ellie. Fair Isle really is a beautiful place to spend some time there. Amazing images Ellie! I have to join you on this trip, it’s on my very long bucket list!